Ever since I started painting I have been a big fan of Henri Rousseau’s work. My father said that the art I was producing had something in common with the naifs and bought me a couple of art books; one on Grandma Moses and the other on Henri Rousseau. So Henri has been one of my heros for such a long time, so you can imagine my joy when I was invited by the organizers of the annual Henri Rousseau exhibition in France to participate. I jumped for joy! The curator is Jacques Dubois who also is involved in the Art Naif Festival in Katowice, Poland which I took part in last year. 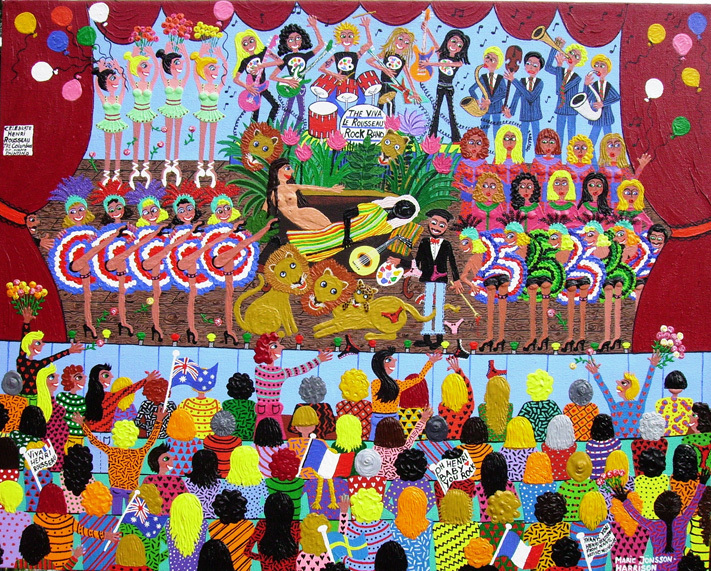 Jac is very heavily involved in promoting Naive art in Europe and throughout the world really and his wife Martha Dubois is a very well known and talented naive artist herself. This year the Henri Rousseau exhibition will take place in the Abbey of Montivilliers in Normandy opening on Saturday 21st January until 19th February with an auction of the paintings being held on 12th February at 3pm. The exhibition itself is open 7 days a week and it is not to be missed. 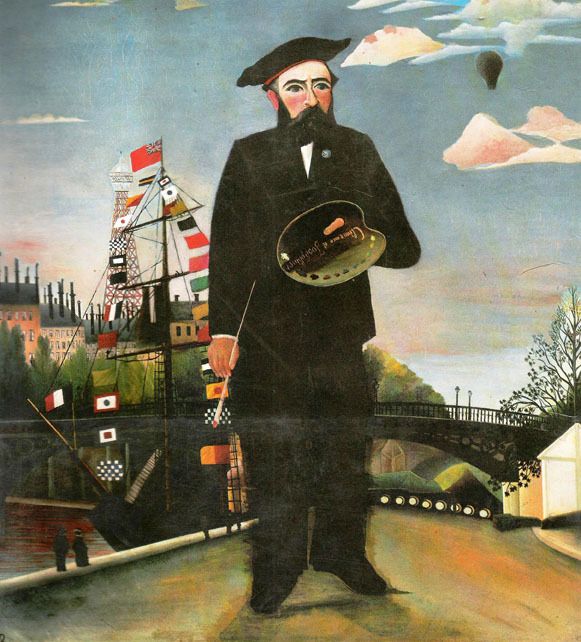 Henri Rousseau was called Le Douanier which translates to the customs (or customs officer)a name he got from his job as a tax collector on goods entering Paris. Henry married twice, first Clemence Boitard with whom he had six children and after she died he married Josephine Noury. Henri also tried his hand at music and writing but it was painting that was his first love, which he started doing seriously in his early forties and by the time he was 49 he retired from his job to pursue the art on a full time basis. Rousseau was represented in the exhibitions of the Salon des Independants from 1886 onwards, and his pictures hung side by side with Matisse, Cezanne, Toulouse-Lautrec, Van Gogh and Picasso. This year 2012 there were 88 artists invited from around the world with 20 different countries represented among them France of course and Spain, Germany, Sweden, Denmark, Finland, Cuba, Belgium, Italy, Japan and “moi” from Australia just to name a few. As this is an exhibition in homage of Henri, most artists are sticking to that theme and I had so much fun painting “You Rock, Henri Rousseau”. I wanted to do a contemporary celebration and incorporated elements of Henri’s art into it by putting in a detail of “The Dream of Yadwigha” (the naked lady lying on the couch). 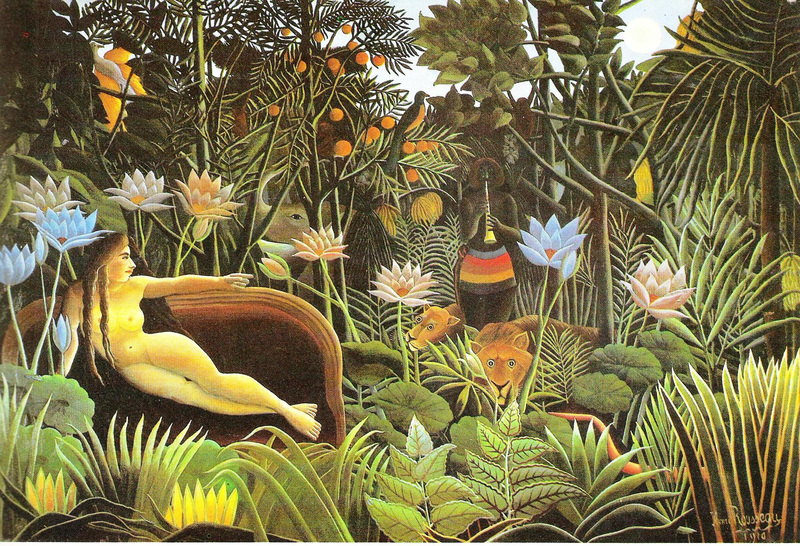 The Dream of Yadwigha was the last painting that Henri painted before his death in 1910, in it the lady in question is laying on a red velvet sofa with a luxurious jungle behind her listening to the notes of a single magic flute. I of course painted a myriad of musicians and singers, artistic license and all that, LOL. If you look a little closer at my painting you will also see the influences of two other of Rousseau’s work in “The Sleeping Gipsy” which is the woman sharing the couch in the striped outfit. 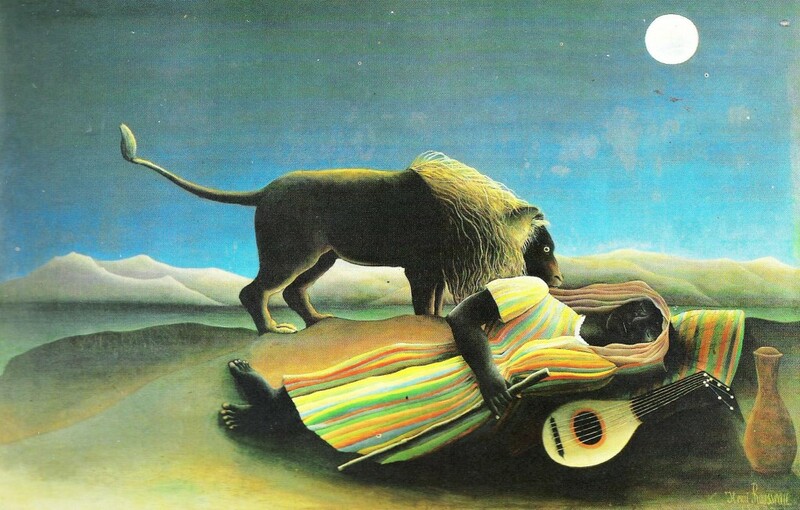 In Henri’s original artwork a lion is standing over her as she lies dreaming under an ancient green sky in the solitude of the desert. Some say this is the lyrical prelude to Surrealism, with a mandolin and a jug which stands beside the sleeping figure, these objects would inhabit the dreams of the Surrealists and the space of the Cubists. The third painting of Henri’s represented in my artwork is of Henri himself, from his self portrait painted in 1890 “I – Myself Portrait-Landscape”, he is holding a palette of paints and a brush and in the original painting he is standing on a road in front of a bridge, although he does look like he is standing in mid air, lol. That is the naive charm, us naives are so lucky that we can just paint whatever we feel and see without having to worry about rules and other people’s perception of how things should look. As the whole idea of perspective is totally lost on me that is really lucky!! Thank you Henri Rousseau – you gave me the freedom to be me, to paint in my own style and not to be embarrassed by the child in me. Instead my childishness it is something that I celebrate and hope that I will never grow up, or out off- but wake each day full of wonder and excitement. So Henri I hope you approve of me painting you like a Rock Star, complete with women swooning at your feet and throwing their knickers at you. There is wild music supplied by a rock band and a brass band as well as the choir and Can Can girls dancing and pirouettes by ballerinas and of course no party is complete without balloons.